As richly facetted as an ice crystal, the Senator Cosmopolite proves the perfect companion for every journey. The timepiece represents uncompromising precision, whether leading its wearer home to a crackling fire, or to sun-splashed lands far away. Its sophisticated mechanics display the time of day in two time zones at once – taking Standard and Daylight Saving Time into account – in any of the world time zones currently in use. At its heart is the manufactory’s 89-02 automatic movement, a 4-Hz masterpiece assembled by hand from more than 400 individual components, with an off-centre rotor and a 72-hour power reserve. Executed in the characteristic style of Glashütte Original, the clear design is reduced to its most essential elements. The dial design and layout of the displays make it a pleasure to check the time, even when it’s icy cold outside. 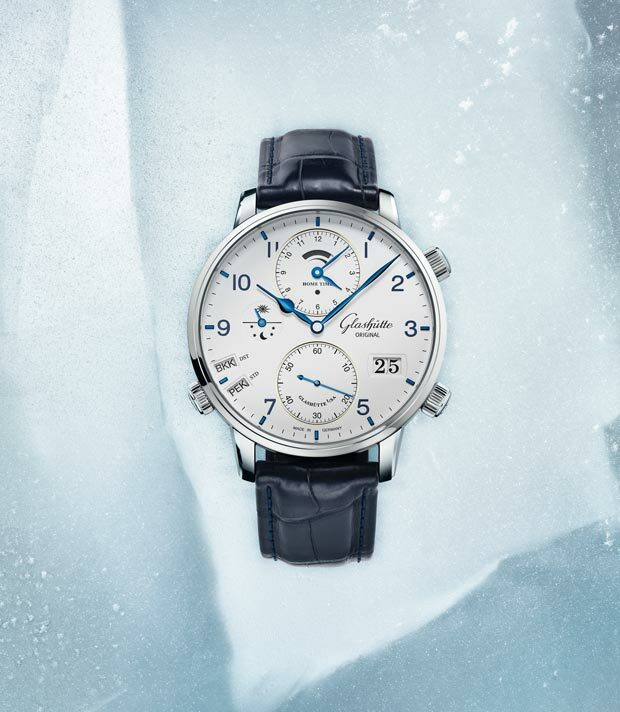 Wintry colours – dark blue and white with detail accents in black – determine the overall look of the watch. An auxiliary dial framed in silver at 12 o’clock presents the home time and integrated power reserve. 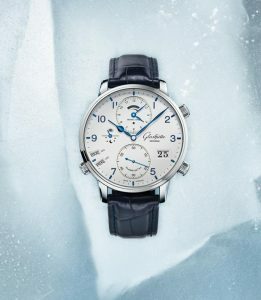 The characteristic Glashütte Original Panorama Date is at 4 o’clock, while two narrow windows at 8 o’clock are set harmoniously within the curve of the dial. Heavenly details are also the source of the PanoMatic Luna’s fascination. 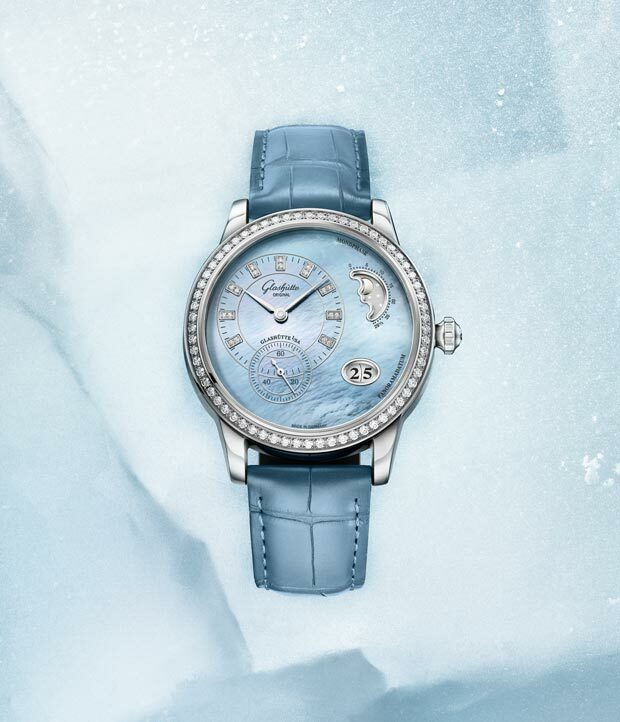 Its refined motherof-pearl dial recalls a frozen lake mirroring the clear winter sky. The beguiling, shimmering face of the watch is the product of elaborate hand-crafting in Glashütte Original’s own inhouse dial manufactory in Pforzheim, Germany. The Panorama Date at 4 o’clock and the intriguing moon phase at 2 o’clock, in which a diamond-cut silvery moon and stars shine from the night sky, also reveal the hand of the artist. The big date, although a characteristic feature of Glashütte Original, remains a rarity in a mechanical ladies’ watch. 83 diamonds totalling 1.09 carats lend the PanoMatic Luna the brilliance of ice crystals in the winter sun. Precisely 64 white brillant-cut diamonds adorn the finely polished, 39.4-mm stainless steel case. An additional 18 brillant-cut diamonds on the dial’s rod indexes take up this brilliance in an elegant fashion. The glittering ensemble is topped off by a large, 3 mm brilliant-cut diamond on the winding crown. A light blue Louisiana alligator leather strap with pin buckle echoes the heavenly blue of the dial and rounds off the timepiece, which features the manufactory’s 90-12 automatic movement, with subtle grace.